His nickname was given to him by a family friend because of his constant coming and going. In fact we here at Guitarhertz have already written about Saul, if you haven’t read that yet here’s a link to the first but make sure to get back here afterwards because you’re not going to want to miss these facts. Let’s jump right in! Following the breakup of Guns N Roses in 1996, he had a few groups before the release of his solo work; I’ll get right into that shortly. His 1st solo album self titled “Slash” was released in 2010. With his 2nd album following 2 years later released in 2012 titled “Apocalyptic Love”. The 3rd was released two years later in 2014 titled “World On Fire.” Now if that isn’t an awesome work ethic I don’t know what is. 3 solo albums released within a total of 7 years. Good on you Slashy boy. This beautiful composition starts with an acoustic that is mimicking the chord progression that an electric guitar follows through. Quite amazing imagery considering the Music Video, definitely worth a watch! Here’s a lesson, enjoy guys! Above all have fun with it. You know what that means folks? Every track, he’s every played on has been completely live and unedited recording wise. Now the mix I can’t guarantee that hasn’t been changed, still quite the impressive feat. This 17 song album was recorded instrumental within 6 days. With some finishing touches afterwards but still another very impressive feat Slash! Good on you. Check out Slash Ft. Myles Kennedy and the Conspirator’s Music Video for their title track World On Fire below. Be aware this video is quite explicit but that’s Rock N Roll baby. If you would like to learn how to play World On Fire here’s the video. Enjoy yourself and remember if you don’t get it right at first, Slash probably didn’t get it perfect immediately either. After 33 years of destruction his appetite guitar is still in use in the studio and on tour. That’s not the only one in use, especially during studio time. Known for also using a Gibson Melody Maker a few different Les Paul Juniors an ES 175, an ES 135 that was once Elvis’s, a Gibson explorer and even a twelve string SG. 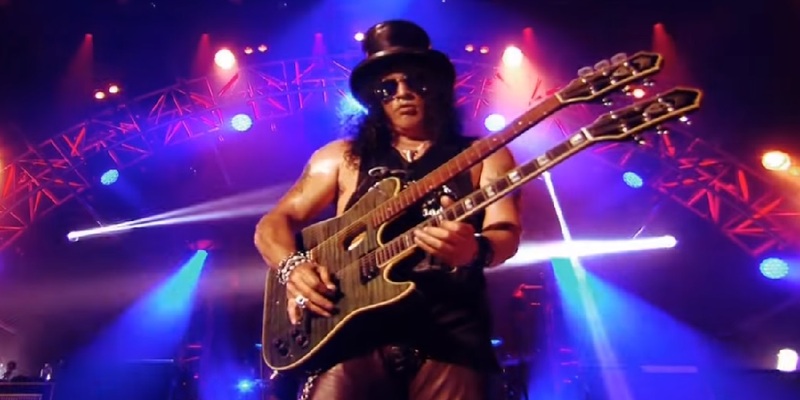 You could definitely say Slash is a Gibson guy. Of course being a National Ambassador for the company who wouldn’t use a ton of Gibson in that position? A little known fact about his original Gibson guitar is that it isn’t even a real Gibson but a 1985 Chris Derek custom copy Les Paul. Still an awesome guitar if you ask me but you’re welcome to tell us what you think about that down below. Sad song, released to raise awareness of homeless teens in LA. Another awesome composition by Slash, this one surprisingly is Ft. none other than Adam Levine and the two make a very special duo at that. Great song to help get your own sadness out and don’t worry if it dredges up some emotion, that’s something all us guitar players share in common. It’s been great informing you about Saul Hudson, better known as Slash or Slashy if you’re me. Mr. Blue signing off, hope everybody has a good one.